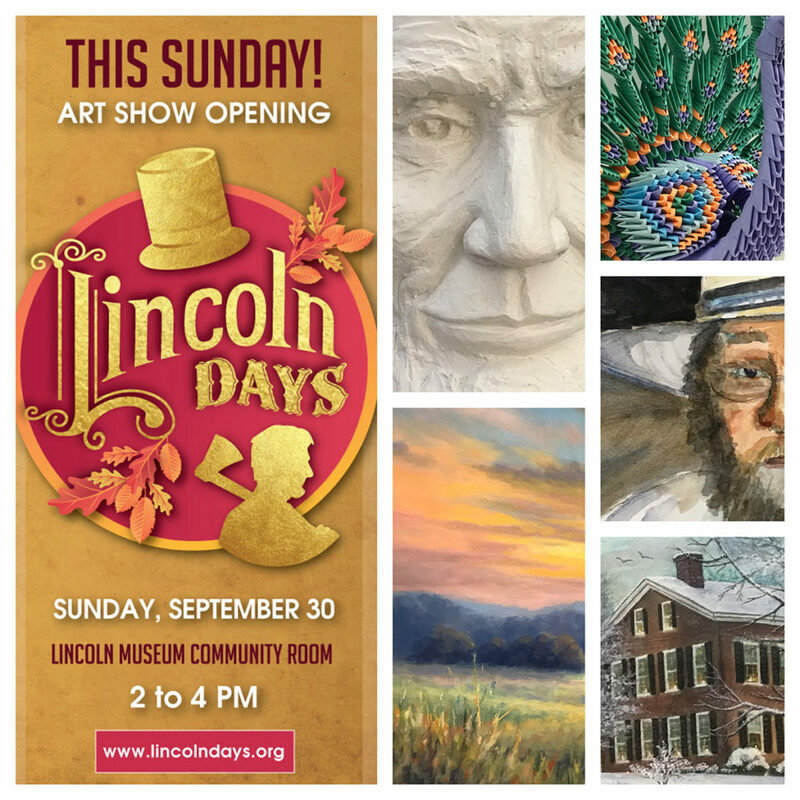 Art Show | Lincoln Days Celebration, Inc.
Sunday, September 30, 2018 from 2-4 p.m.
Everyone is welcome to attend our opening reception. Monday-Saturday, 10 a.m. to 4 p.m., Sunday 1 to 4 p.m.
All rules and fees listed below and listed on the official entry form apply to this division. Any Subject. Artist Original Work. $10 entry fee per work. Any Medium. Artist’s original concept of any phase of Abraham Lincoln’s life or legacy. Purchase Winner becomes part of Lincoln Days Collection on permanent display at The Lincoln Museum. There are currently 45 pieces in this unique collection. Lincoln Days gains all reproduction rights to the Purchase Winner. Any medium. Any subject. Artist’s original work. $ 10 entry fee per work. $5 entry fee per work. Open to LaRue County residents age 17 and older, this division will showcase the talents of our many local artists. Number of entries may be limited due to space available. Works must be original. NO photo mechanically reproduced prints. NO items made from kits. NO items purchased and decorated. Classroom work is acceptable, but must be artist’s original concept. Entries must be suitably framed, equipped with wire, ready to hang. No more than 36” wide. No more than 75 pounds. Three-dimensional works must be self-supporting or have companion stand. Lincoln Days, Inc. will exercise the right to reject any work.